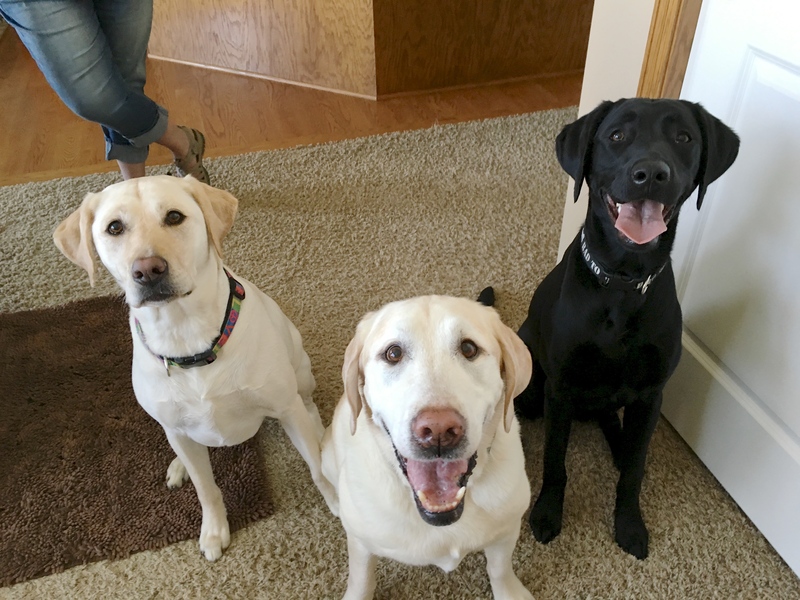 Lola (left) is a four-year-old Yellow Lab who lives with a couple of other Labs in Omaha; Dale and Max. Their guardians called me in to put a stop to their habit of getting over excited, jumping up, barking, lack of respect for personal space, demands for attention and Max’s fear and insecurity around strangers. I got a pretty good read on the dogs the second that I came inside. While Lola and Dale showed a healthy curiosity, Max’s barking from a distance and then retreating after each bark indicated that he had some insecurities. I sat down with the dog’s guardian to discuss the situation and how I could best help them. While we were chatting, Max wondered around the perimeter of the room while barking at me in disagreement. Many people try to make friends with dogs who act this way; reaching over to pet them, talking to them in a calm or soothing voice, offering treats or doing other activities to prove to the dog that they are a good person. But if a dog is in an unbalanced state of mind and is reacting to you, just about the worst thing you could do is to try to engage with that dog. Instead, I ignored Max completely; I did not try to pet him, talk to him or even look in his direction. Once Max determined that I was not interested in him, he stopped barking and then came over to investigate me himself. I suggested that in the future any visitors should completely ignore Max in the same way. If his barking continues for a prolonged period of time I suggested that they pull out a leash and place it on the dog to prevent him from barking and then running away. The main thing is for the humans that he is disagreeing with do not try to engage with him in any way, shape or form. Because Max is still a puppy, it’s not too late for his guardians to build up his confidence by taking him out of the house while carrying a handful of high value treats. When they encounter a male out and about while they have Max on a leash, they should put Max into a sit, then have the human stand or preferably squat next to Max (about 1-2 feet away) facing the same direction so they are shoulder to shoulder. Then the person can extend their hand to their side with the palm up and a treat in the palm of their hand for Max to get. If Max is able to meet a number of unknown men who approached him in a very soft, slow movement sort of way and then kneel or squat next to him so that they can offer him a treat to their right or left side without him feeling confined or confronted, his guardians can help him get over his fear of strangers. As I was finishing up our conversation about Max I noticed that Lola was nudging or pawing at her guardian whenever she wanted attention. Because the guardian instinctively reached over and petted the dog each time that she did this, it’s easy for Lola to get the impression that she has authority over the humans. After all, when she tells the to do something, they comply. When a dog considers itself equal in authority to humans, then following their commands or corrections is entirely optional. To help Lola adopt more of a follower mindset, I spent the next few minutes discussing a technique that I have developed called Petting with a purpose. It’s going to take all of the humans a few days to a week of consistently asking the dog to sit or lay down before they pet them before the technique becomes habit. But once that is the case, they will reinforce the leader follower dynamic they are looking for without even thinking about it. Next I asked what rules the dogs were expected to follow. As it turns out, their really weren’t many rules in place. When you have dogs that don’t have many rules, then humans don’t spend much time correcting or leading their dogs. But disagreeing with dogs with good timing (within 2-3 seconds) is a crucial part of how dogs learn. When you combine a lack of rules, with dogs that are able to tell their humans what to do, like petting on demand, it’s not at all uncommon for the dogs to lose respect for the humans as authority figures. This can cause the dogs to stop listening and in some cases, add stress. This was certainly the case with Max. To help the humans return to their authoritative role in the dog’s eyes, I spent the next few minutes going over some rules that will help the guardians establish a healthy leader follower dynamic. As we were wrapping up this discussion, it became clear that the dogs just had too much excess energy for me to effectively work with them. I headed outside and strapped on some rollerblades so that I could do a little bit of dog skiing and burn off these dog’s excess energy. This activity not only burns off excess energy, its also a great way to incorporate some leash training. I recommended that the guardians look for ways that they can increase the dog’s activity to burn off this excess energy. While Max’s fear is not a result of too much energy, it absolutely impacts his reactivity. Usually I recommended an average dog gets 45 minutes of constructive exercise a day. But because Max and Lola are higher energy labs in their prime, it’s a safe bet that adding even more exercise to their regimen will pay big dividends. While walks are great, you can use other activities to burn off excess energy such as a game of fetch. Because they are both retrievers, I recommended that they check out a Go Dog Go machine which allows dogs to play fetch with themselves. As we were wrapping up the discussion about exercise, one of the guardian’s mothers arrived for a visit. I used this opportunity to demonstrate how the dog’s guardians can ask the dogs to stay away from the door to train them learn to settle down and control themselves. I failed to ask the guardian to continue filming me, so the video got cut off a little bit sooner than I wanted. Normally I don’t ask a dog to sit when conducting this exercise, my only goal is to have them respect the boundary line that I am forced by marching at them whenever they cross it. But because Max’s moving around was increasing the intensity of his reaction, I hoped that by placing them into a stationary position it would help him relax and calm himself down. This sort of scenario is called a cold exercise as the dogs have not practiced or warmed up in preparation for it. This is as real world as it gets. Sometimes it’s helpful to keep repeating an exercise over and over which we like to refer to as “warmed up.” This allows the dog to understand what’s coming next and to default to a behavior that we have trained them to use. Dog obedience training is really all about repeating the scenarios and situations that our dogs struggle with. You don’t have to go to dog school in order to fix dog behavior. You just have to have really good timing with your corrections so that the dog can associate your disagreement with their activity. Later on in the session, one of the dog’s guardians arrived which gave us another opportunity to practice the door answering ritual. This time I coached the dog’s guardian through the exercise herself. I suggested that the guardians call or text one another when they are on their way home and park on the street rather than opening the garage door. This gives them the opportunity to practice this exercise in a cold way when they are prepared for it but the dogs are unaware. By the end of the session Max had adopted a much more calm demeanor. He was not pacing around the room or looking back-and-forth nervously as he was when I arrived. Lola and Dale both seemed to be looking at their guardians for guidance and corrections and had already started to sit in front of a human instead of the nudging or pawing at them for attention. Adding rules and structure will help the dog start to see and identify the humans as being in authority position this will help Max with his fearful behavior and anxiety as there is certainly less stress when you are not in a authority position. I also recommended that the guardians tried to teach Max a number of new tricks. Setting a goal of teaching him one new trick a week or the next two months will go a long ways towards helping him build up his confidence. That, combined with creating positive interactions with strangers while he is still young should restore his self-esteem so that he no longer feels the need to bark when he’s uncomfortable.